The construction of this footbridge is an old claim of the inhabitants of the two neighbourhoods separated from one another by the trench of the BV-1432 road. These two residential areas, Terra Alta on the south bank and can Gili on the north one, have a different nature: can Gili is a dense zone with shops and community services, but no green areas, and Terra Alta is a low density urban area, with a community park, but with no services. So far, people from one neighbourhood wanting to go to the other one had to make a detour, crossing the road through a highway bridge, placed at the east border of these urban areas, with a single narrow footway in one of the sides of its deck. 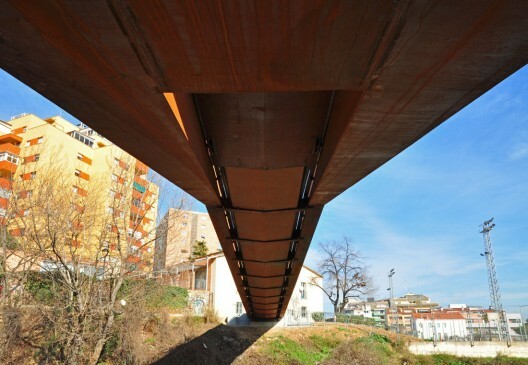 For these reasons, at the beginning of 2001 the Granollers Borough Council commissioned Alfa Polaris (http://bierot.net) to carry out the concept design and the detailing document of a new link between these two urban areas. 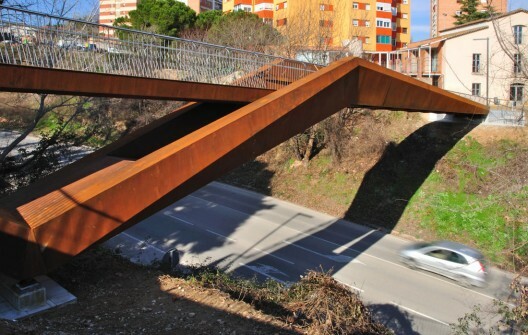 The design of the proposed link, a footbridge next to the junction of the Sant Ferran St. with Verge de la Mercè St. and Sant Marc St. at the Terra Alta side, was strongly conditioned by the asymmetric shape of the cross section of the road trench. 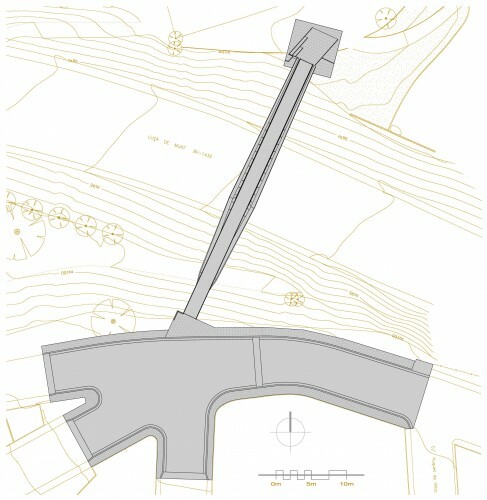 The team, led by structural engineer Xavier Font, looked for a design that highlighted this asymmetry marked by the different level of the two banks —Terra Alta’s bank is 4.3 metres higher than can Gili’s one— and the presence of a small platform in the middle of the south cutting of the trench. 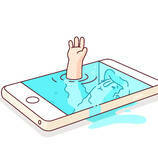 The client and the designers looked for a solution with reduced whole life cost and environmental burdens. 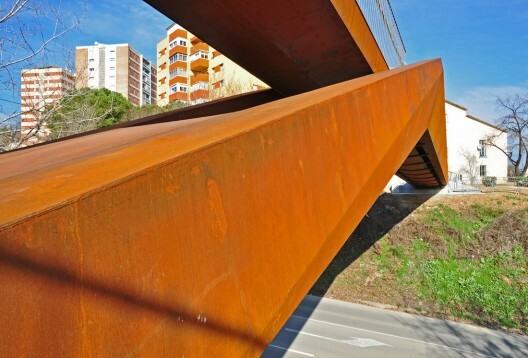 This is the reason why we chose Corten steel —whose rusted skin protects itself from further corrosion— for the structure, LED lamps —with long life span and energy efficiency— for the street lighting over the deck, and polymeric timber —with almost no maintenance— for the decking over the structure. The client was also very interested in reducing the possessions of the road to the minimum. This was another reason why we chose steel as a material for the deck. Steel components can be manufactured offsite, easily transported and put into place very fast by a small number of skilled personnel, reducing disruption and disturbance around the site. Four one-day possessions —two to erect the structure, one to dismantle a temporary tower and the forth one to carry out the static load test of the deck—, with traffic diverted through alternative routes, were necessary to built the footbridge. 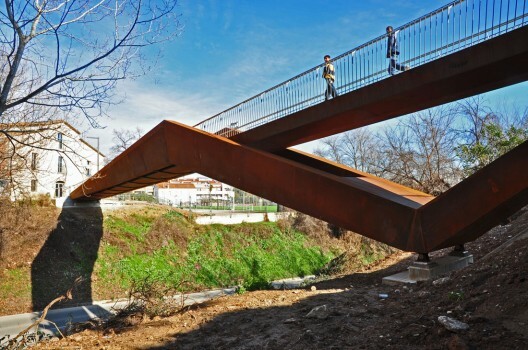 We proposed a cranked shape beam, varying in width and in depth, spanning 32.7 metres, formed by two Corten steel longitudinal hollow box girders. Over the main span the footpath is channelled by this two box girders which are linked together at bottom flanges by transversal beams. The latter, in turn, give support to the two metre wide polymeric timber decking through longitudinal joists. Over the north foundation, placed on the mentioned platform, the main cranked beam takes a V shape, the top ends of which give support to a small deck. This, linked to the main structure by means of two sets of steel hinges, spans 13.9 metres. Doing this way, we avoided to build a foundation on the top of the south cutting of the trench, which had very bad ground conditions. At this V shape section, the two girders that form the main beam are linked together through transversal diaphragms hidden by external plates, so that the beam seems to be a single bow girder. In this project, steel also allowed us to easily achieve the sculptural forms the proposed design required. Moreover, its high strength-to-weight ratio resulted in a very light structure and the consequent savings for the foundations. Using steel for the deck permitted us to manufacture the deck in the controlled environment of the fabrication workshop, so that, meanwhile the foundations, the piers and the abutments of the footbridge were made on site, the steel structure was being fabricated. 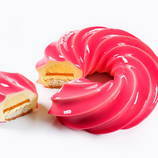 This helped us to increase the quality of the product and speed up the construction process. Taking into account future needs, below the timber decking, seven pipes were provided for utility services to be installed. For this reason, the webs of the transversal beams that link the two main girders and the transversal diaphragms of the south side deck, have seven holes to allow pipes to pass through them. 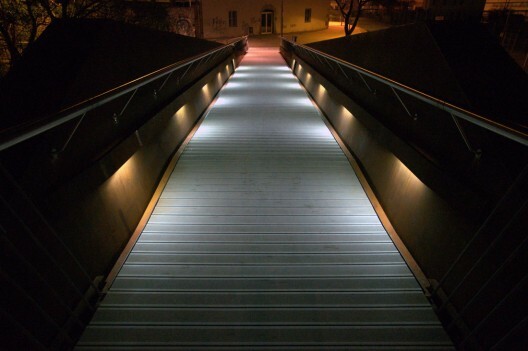 On the deck the street lighting is provided by means of twelve LED lamps, supported and protected from vandalism by means of Corten steel shelters fixed to the inner webs of the main structure. Additional lamp columns, with stainless steel stems, were installed on both approaches. 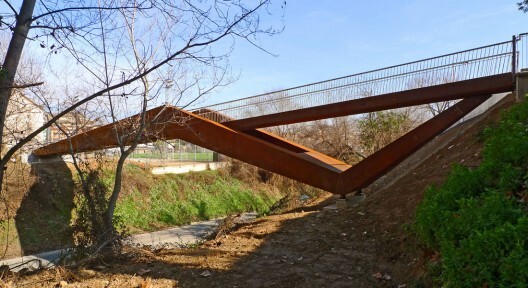 In 2009 the Granollers Borough Council got the necessary funds to build the scheme, and subsequently Alfa Polaris was commissioned to carry out the site supervision. The construction of this footbridge started in June 2009. The upgrading of the south approach, at the Terra Alta’s side, as well the micropiled foundations of the abutments were first made. Next, the stems were built. Meanwhile the steel deck was being fabricated in Ripollet, 20 kilometres away from the site. When the abutments were finished and the bearings put into place, the steel structure was transported to site and lifted. 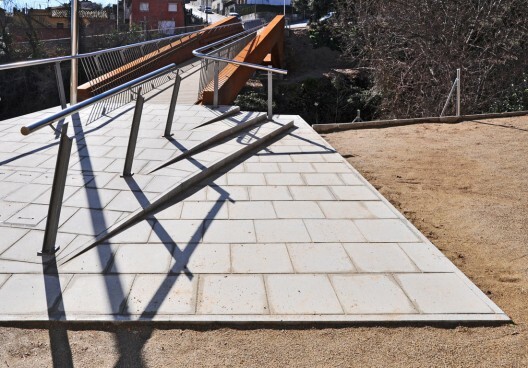 Eventually, meanwhile the north approach was built, the polymeric timber paving was placed and the street lighting as well as the street furniture installed in order for the footbridge to be open to the public at the beginning of 2010.